We loved this one! The family said it tasted like KFC! 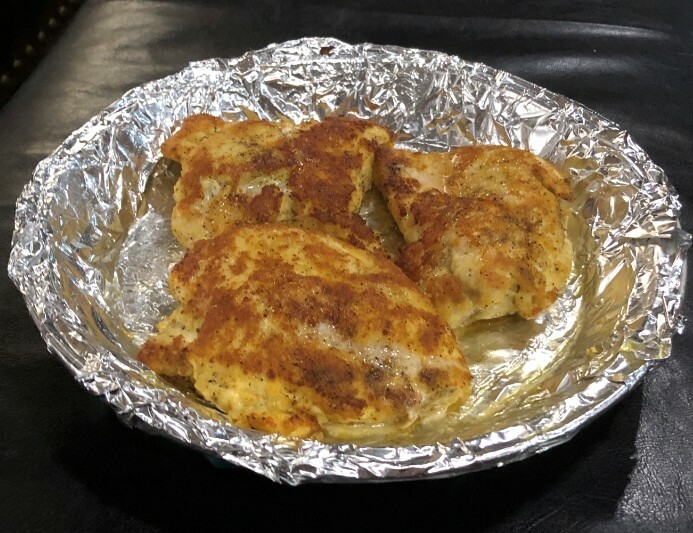 Healthy, breaded (kinda) chicken? Yes! 1. Pound the chicken thin (1/3"). Save time, space, and mess by first placing chicken inside a gallon freezer bag to pound. Set aside in bag. 3. Pour 1/4 cup parmesan into a bowl and sprinkle with salt, pepper, and paprika. 4. Whisk egg and pour into the bag of chicken. Squish chicken around until fully coated. 5. Drizzle olive oil in a skillet on a stovetop until so it's well coated and slowly heat the oil. 6. Remove one coated chicken breast and place into cheese bowl. Coat both sides. 7. 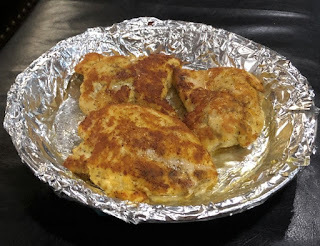 Add each "breaded" chicken breast to the heated skillet and brown both sides. Don't crowd them. Do in batches if needed. 8. Spray glass pan or baking sheet with cooking spray. Use foil for easy cleanup. Add browned chicken breasts. 9. Place in preheated oven for about 25 minutes. Chicken is done when juices run clear. Serve with vegetables for a full Lean & Green meal.